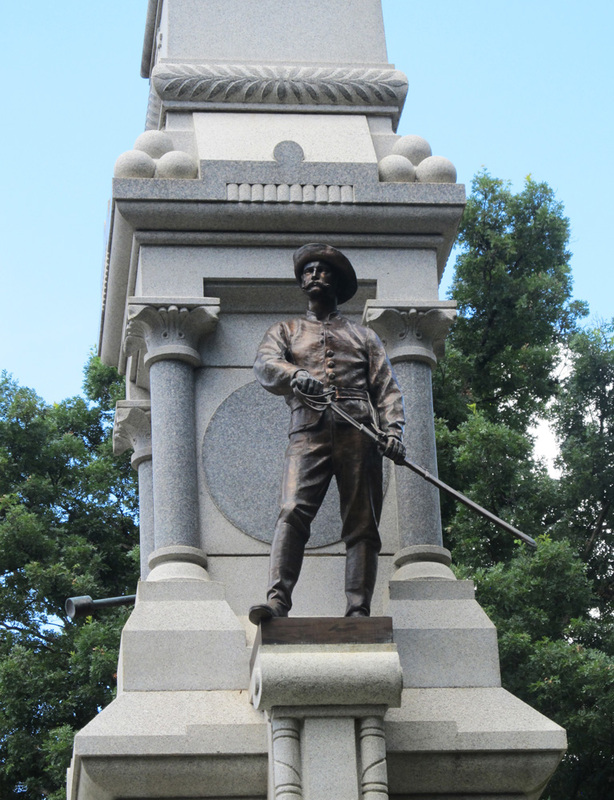 Description: This 75-foot-tall monument to fallen Confederate soldiers is located on the State Capitol grounds. 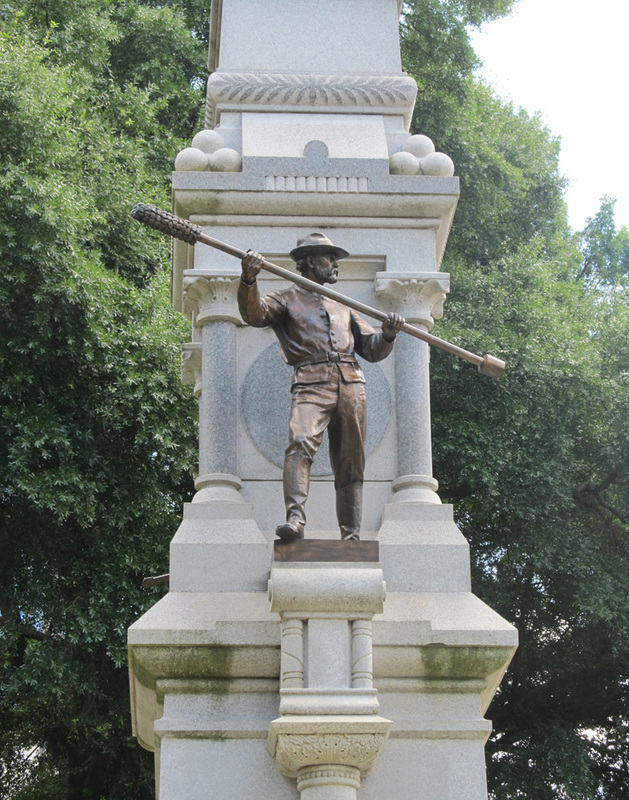 At the top of the column is a statue depicting a Confederate artillery soldier holding a gun. 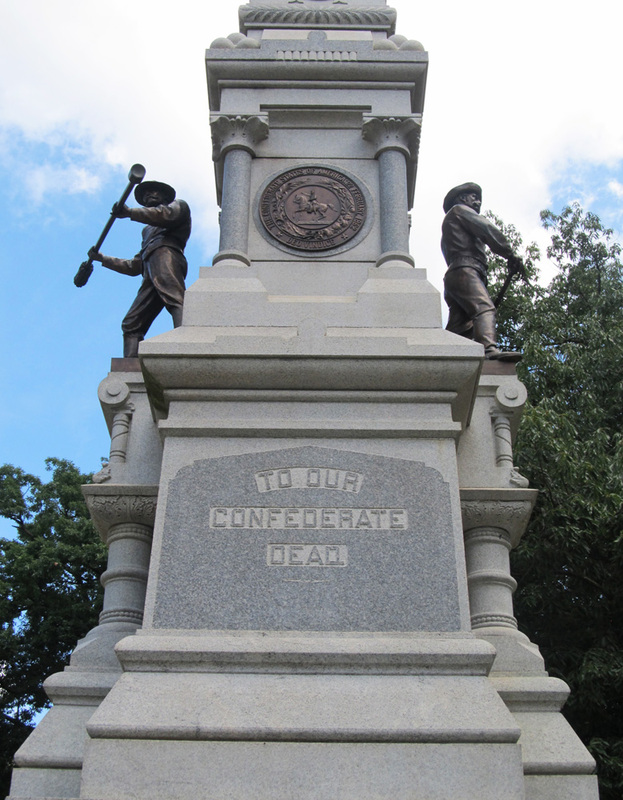 Near the bottom of the column are two statues, one representing the Confederate infantry and the other a Confederate cavalryman. 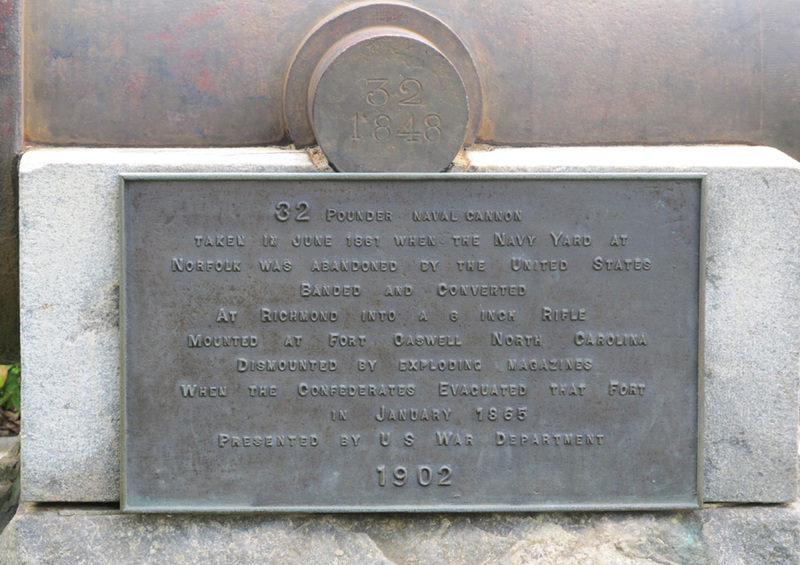 Two 32 pounder naval cannons stand on each side of the monument. In 1892, state legislators endorsed the goal of building a Confederate monument in Capital Square. Secretary of State Octavius Coke held a meeting of members of both the Ladies Memorial Association and the North Carolina Monumental Association in June 1892 to launch a campaign to erect a memorial to deceased Confederate soldiers from North Carolina. Rear, on base: FIRST AT / BETHEL / LAST AT / APPOMATTOX / 1861. 1865. Unveiling & Dedication: Dedicated on May 20, 1895. Unveiled by Julia Jackson Christian, Granddaughter of Stonewall Jackson. Speakers included Captain Samuel Ashe, Thomas W. Mason, and Alfred Waddell. Post dedication use: The Civil Works Authority made plans to move the monument from Capital Square to Nash Square in 1934 as part of renovations to Capital Square, but the Board of Public Buildings and Grounds decided on February 5th to prevent the CWA from moving the monument. The move was prevented because of public outcry in regards to moving such a historically significant monument from a highly visible location. Subject notes: The initial model for the statues was to be the Confederate hero Henry L. Wyatt, but the sculptor Von Miller used W. R. Dicks (who was a living Confederate veteran) as inspiration for the statues. Controversies: When the monument was first proposed, Populist and Republican legislators objected to any public funding of the monument on the grounds that public education, rather than sectional pride, was a pressing need. In addition, monument opponents protested against the special tax fund that would be used to subsidize the monument's costs. During the 2000s, some critics questioned whether it was appropriate to continue to commemorate, on capitol grounds, white soldiers who fought to establish a slaveholders' republic. 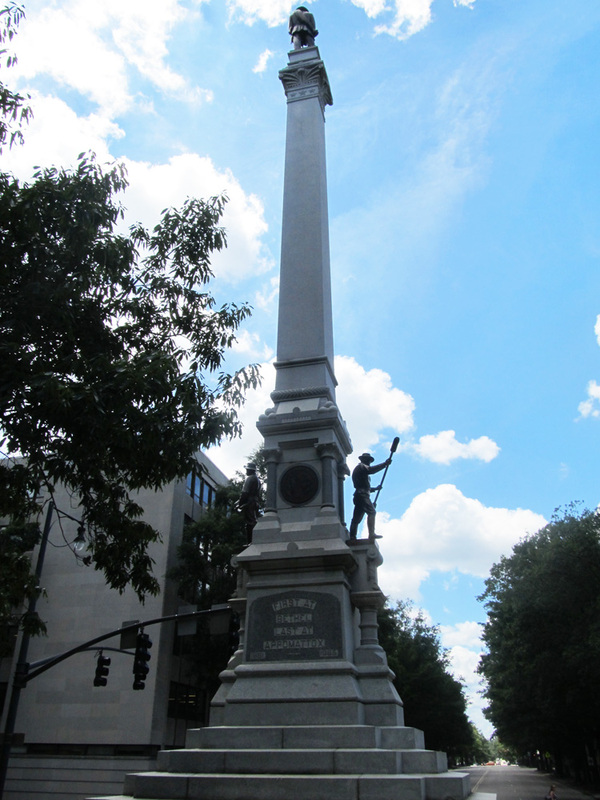 Location: This monument faces Hillsborough Street and is parallel to South Salisbury Street. It is surrounded by trees and a paved pathway. Directly behind the monument is the State Capitol building. 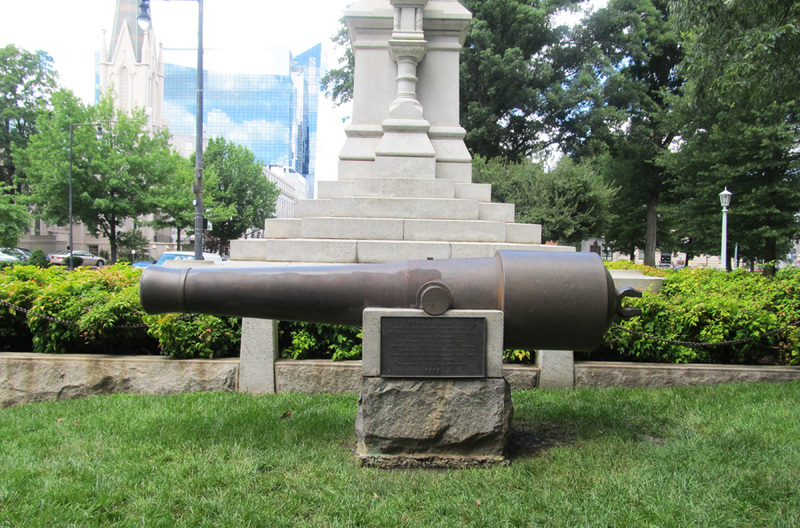 Landscape: The monument is located at the end of Hillsborough Street on the west side of the capitol grounds. I'm a Yankee and would have fought for the Union in the Civil War... but North Carolina is my adopted home and I love this great State. 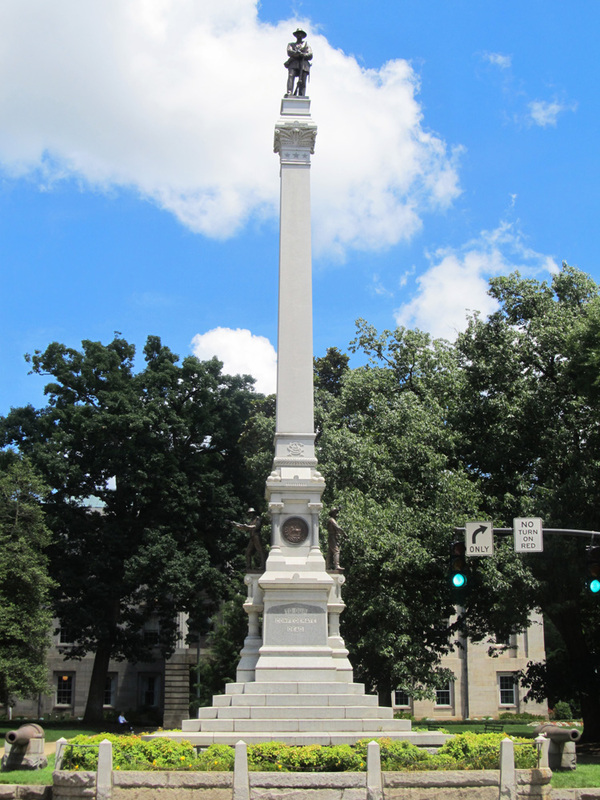 That said, I strongly believe that removing this monument to the Confederate Soldiers of North Carolina who gave everything they had for their State would be the ultimate insult to their sacrifice. This monument consecrates their valor, courage, and dedication to the state they fought and died to protect. The vast majority of those southern Patriots never owned a slave and did not go into battle to preserve the institution of slavery. Rather, they gave their lives for their State, their land, their homes, and their families. Moving this monument dishonors and disrespects everything they fought for and says they shed their blood for nothing. It also is a slap in the face to their descendants... because it shouts loud that their ancestors (from not so long ago) were somehow despicable, contemptible, and shameful and do not deserve the honor of a place on the grounds of our Capitol. These men and the State of North Carolina fought to maintain the institution of slavery. 50 years after his murder, why isn't there a single statue of Martin Luther King anywhere in the Old South? Why hasn't any city or state erected a 15 foot statue of him on a 50 foot pedestal in the center of a city? Wasn't he a Christian? Didn't he advocate non-violence? Slavery was bad, but the Jim Crow Era was worst. Does the south acknowledge the 4,000+ lynching that occurred through the 1950's and 1960's? Does the state of North Carolina brag that no Federal Anti-Lynching law was NEVER passed by the federal government? Who blocked its passage? Keep your history, but give a BALANCE account of it, please. I am from North Carolina. I have ancestors that fought for the Confederacy. There is even a small memorial to them in Northern Wake County. Consider the fact that African American men and women that live in this county have an entirely different experience than you and I. They deal with racism and prejudice on a level that we do not. Consider that a monument to celebrate the men that died fighting for a cause that includes the slavery of their ancestors might be deeply offensive because of their experience. Why should the government continue to keep and maintain such a symbol? It should be removed because we as a people should agree that the monument is hurtful and depending on your experience deeply offensive. As I white man I will never fully understand the nature of what they feel, but it is pretty clearly hurtful. Move the monument. Preserve it for history. 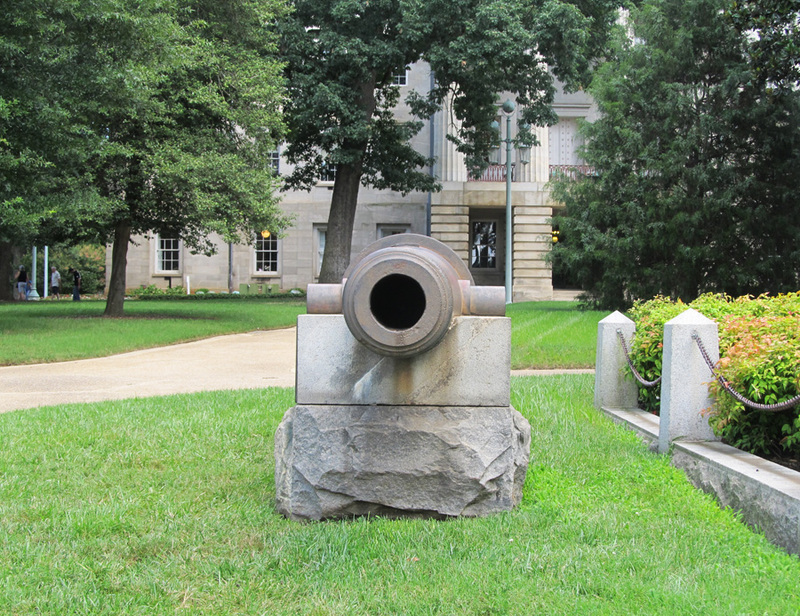 Teach about the war's significance and about what it meant to NC. It is a huge part of history in this state. It has an appropriate place, but the state capital is not that place. History - it's just that "history". It's our heritage; it's what our forefathers lived through. Why would you want to erase history? Statues don't represent hate - people represent hate. Statues are only a representation, not a living, breathing human being. Only humans can demonstrate hate. Erasing history, destroying or removing statues or monuments only erases history for our children and our children's children. Erasing history is similar to when Hitler wanted certain books banned and burned. WHY? So we can be subversive or opposed to "history". What's to happen when a book is read, and it refers to a particular statue or monument? What happens when children want to take a trip to visit these statues or monuments mentioned in these books? Next thing you know, these books will then have to be destroyed because they refer to statues or monuments which you people have destroyed. When will the madness stop? Look up the definition of history and understand what it means. Let history remain history and not be washed away, eliminated so all we are left with is a blank empty slate. Enough is enough! Absolutely agree! People perpetuate hate, and only said people can look at an object and derive hatred from such. History allows me to decided what I should and should not do now and tomorrow, not a statue or monument of the past. I look at any statues or monuments only as a brief reflections of the past that reminds me what was, not what is or will be. If your today or tomorrow is not pleasing, it is you that should be reflected upon to decide what you should do to improve, and that is something no one can prevent or change, especially with statues or monuments. Do not dwell on the past, it is over and cannot be changed, but who you are today and how you feel tomorrow can change if needed, and only you decide. 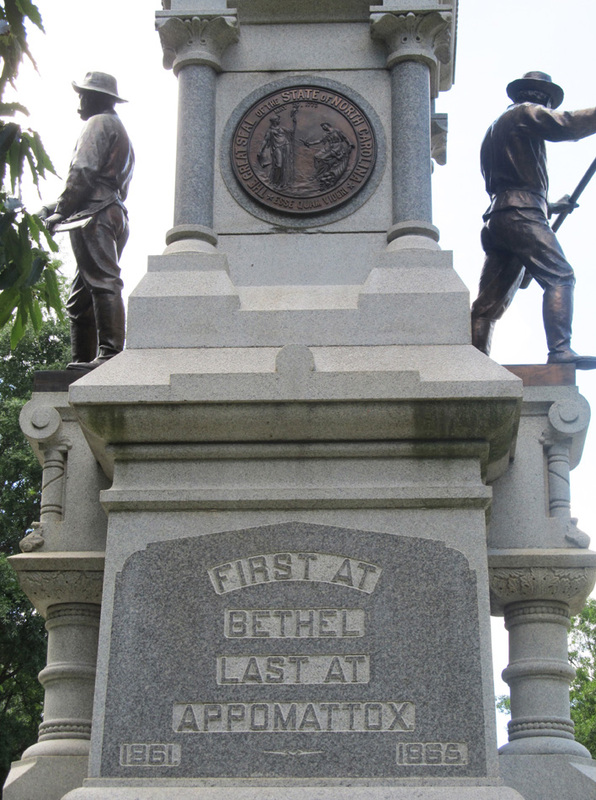 What most folks don't realize is that most Confederate statues, including this one, weren't built just after the war as a solemn reminder of heritage, they were built later just after Jim Crow was declared constitutional and the lynching era began. This statue being built in front of the state house was built for a very specific purpose, and that was to terrify black people. Full stop. I agree. These monuments are symbolic of a disregard for and hatred of people of color. Moving them will not take away the history or disrespect those who fought for the Confederacy. It will show respect for people of color and continue to remind us that no people should be disrespected because of race, color, or religion. Agreed They should all be removed! Removing monuments is a waste of money! It will not resolve anything. You cannot erase or change history. Its ignorant to think you can.Keep in mind that the men in the Civil War were conscripted to fight the war. These men are human and should not be forgotten!